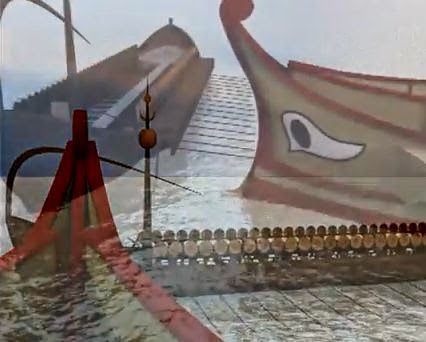 Italian freelance 3D computer modeller Francesco Frazzitta has made some impressive renderings of the Marsala ship and its demise at the hands of the Egadi 1 ram mounted on a Roman trieres. The Marsala ship was a wreck found with another off the Ægadi Islands in 1969. They were identified as Carthaginian and have subsequently been much discussed. The wreck appeared to have a single tier of oars but they were possibly double-manned. Its curious upturned 'ram' is probably a structure to facilitate operating in areas with many sand bars rather than a weapon. Its companion ship was equipped with a bronze ram of which only the supporting timbers remained. Frazzitta's graphics of the Marsala ship are also impressive. I am working on the Roman-Carthaginian naval conflicts now and it is great to see these archæological remains brought to life.